Most of the petrologic data has been gathered from the examination of thin-sections with a petrographic microscope. Hand specimens of rocks were stained to determine plagioclase/ potassium feldspar ratios. The staining technique developed by Baily and Stevens (1960) was used. Mineralogic composition of some zeolite veins and whole rocks was determined from x-ray diffraction patterns. 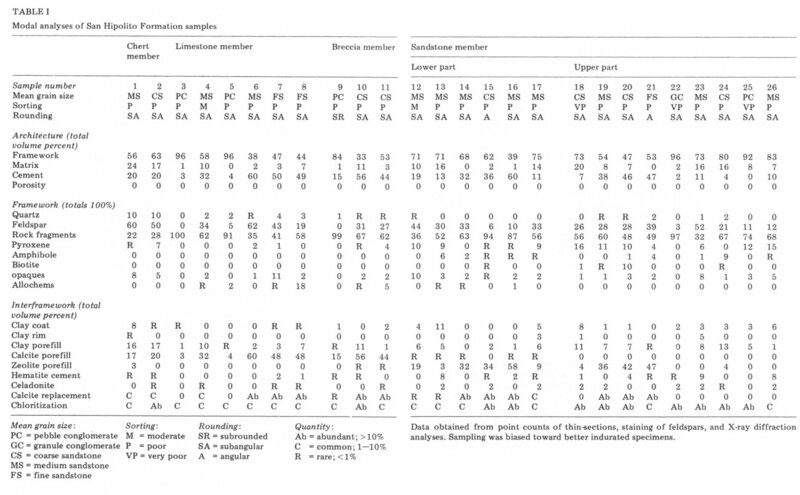 Eighty thin-sections were examined microscopically and modal analyses of twenty-six sandstones and sandy limestones were made (Table 1). Sampling was biased because the fresher, less crumbly samples which were preferentially collected in the field contain higher percentages of calcite cement. A mechanical stage attached to the petrographic microscope was used to advance the thin-sections beneath the microscope crosshair at 1 millimeter intervals. Framework, matrix, cement and porosity percentages (Table 1) are based on a count of the first 100 points encountered beneath the crosshair in each thin-section. The count was continued until 100 framework grains were identified. Sandstone components are almost exclusively of volcanic origin. The remaining framework grains are limestone rock fragments and carbonate allochems. Every member of the San Hipolito Formation contains volcanic grains or ash including the bedded chert member and the limestone member. Volcanic rock fragments make up from 22 to 100 percent of framework grains (Table 1). Most volcanic rock fragments are microlitic, indicating an intermediate volcanic composition (Dickinson, 1970). Felsitic and lathwork volcanic rock fragments, which are representative of silicic and basic volcanic composition respectively (Dickinson, 1970) are less common but constitute a significant part of the volcanic rock fragment population in a few samples. Vitric volcanic rock fragments are present but are even less common than the above mentioned types. Feldspar constitutes as much as 60 percent of the framework grains (Table 1). Almost all feldspar is plagioclase and many plagioclase crystals display oscillatory and normal zoning. Staining indicates the absence of potassium feldspar in most rocks. In the few sedimentary rock specimens in which it is present, potassium feldspar constitutes less than 1 percent of the total feldspar. Quartz makes up no more than 10 percent of the framework grains in any sample (Table 1). The quartz is monocrystalline, often embayed, and usually inclusion free indicating that it probably is volcanic in origin (Folk, 1968). Subordinate framework grains include magnetite and other opaques, pyroxene, amphibole, and biotite. They comprise as much as 18 percent of some rocks and have the same mineralogical characteristics as the phenocrysts and accessories found in volcanic rock fragments in the same thin-sections. They have been derived from the fragmentation of volcanic rock fragments and some may represent crystalline tuffaceous material. Quartz, feldspar and rock fragment percentages from modal analyses (Table 1) have been recalculated so that when added together they equal 100. The values are plotted on Figure 4, which shows that the rocks are quartz-poor members of the lithic arkose, feldspathic litharenite and litharenite clans. To be more specific, the rocks belong to the volcanic plagioclasearenite, plagioclase volcanic-arenite, and volcanic-arenite clans since most of the feldspar is plagioclase and most of the rock fragments are volcanic. The freshest pillow lavas contain glomeropheric augite phenocrysts and rare, unzoned plagioclase phenocrysts. Groundmass plagioclase crystals have an intersertal texture with chlorite, magnetite, and zeolite interstitial in the plagioclase laths. Amygdules up to 5 millimeters across are composed of inclusion-free multicrystalline quartz and greenish-yellow, spherulitic chlorite. Chlorite penetrates into some of the quartz crystals. Rarely, spaces that are shaped like the pyroxene clusters are filled with chlorite and quartz. Thin, subparallel, chlorite- and zeolite-filled fractures, many of which pass through amygdules, are found spaced 1 to 2 millimeters apart. Coarsely crystalline calcite fills some interpillow spaces and cracks in fractured pillows. Rarely, interpillow spaces contain red, hematitic, partly silicified, radiolarian, pelecypod dolomite. The rock is packed with pelecypods which have been tentatively identified by David L. Jones (personal communication, 1975) as Halobia? sp. or Daonella? sp. of Late Medial or Late Triassic age. Radiolarians are abundant and replaced by calcite. Finely crystalline euhedral dolomite occurs as patchy replacement and fracture filling. The pillow shape of the lava and the presence of marine fossils in interpillow spaces indicate that the lavas were erupted in a submarine environment. Most of the chert member is composed of pale green to dark green, radiolarian-sponge spicule-pelecypod-bearing tuffaceous chert. Very finely divided celadonite (identified from an x-ray diffraction pattern of a powdered, whole rock sample) gives the rock its green color. The rocks are finely laminated. Silt-size shards and crystals of plagioclase and quartz are common in thicker laminae. Radiolarians, sponge spicules, and Halobia? sp. generally make up less than 10 percent of the rock. Up to 95 percent of the radiolarians and sponge spicules are replaced by calcite. The matrix consists of aphanocrystalline to very finely crystalline, equant chert and randomly distributed patches of very finely crystalline to finely crystalline calcite. Silica from radiolarians, sponge spicules and volcanic ash, and calcium carbonate from pelecypods and probably calcareous microfossils were remobilized and recrystallized to form the calcareous cherty matrix. Celadonite probably formed as an alteration product of volcanic ash during diagenesis. Interbedded with the green tuffaceous chert are beds of red, hematitic, packed radiolarian chert. Red chert masses are rarely lens shaped. The red color is imparted by abundant finely disseminated hematite. As much as 75 percent of the rock is composed of well preserved to partly recrystallized radiolarians and less common sponge spicules. The matrix consists of aphanocrystalline to very finely crystalline chert. Minor beds of grayish black, radiolarian, sponge spicule chert and light gray recrystallized radiolarian chert are present in the vicinity of a sill that intrudes the chert member. The black chert is similar to the red chert except the color is imparted by very finely crystalline pyrite instead of hematite. The gray chert, which is grayish orange on weathered surfaces, consists of very finely crystalline to finely crystalline equant chert and finely crystalline chalcedony with rare patches of unrecrystallized radiolarian chert. Fractures are filled with finely crystalline to coarsely crystalline calcite with fibrous, yellow chlorite inclusions. Chlorite-filled stylolites are present. Pyrite replaced volcanic rock fragments are rare. 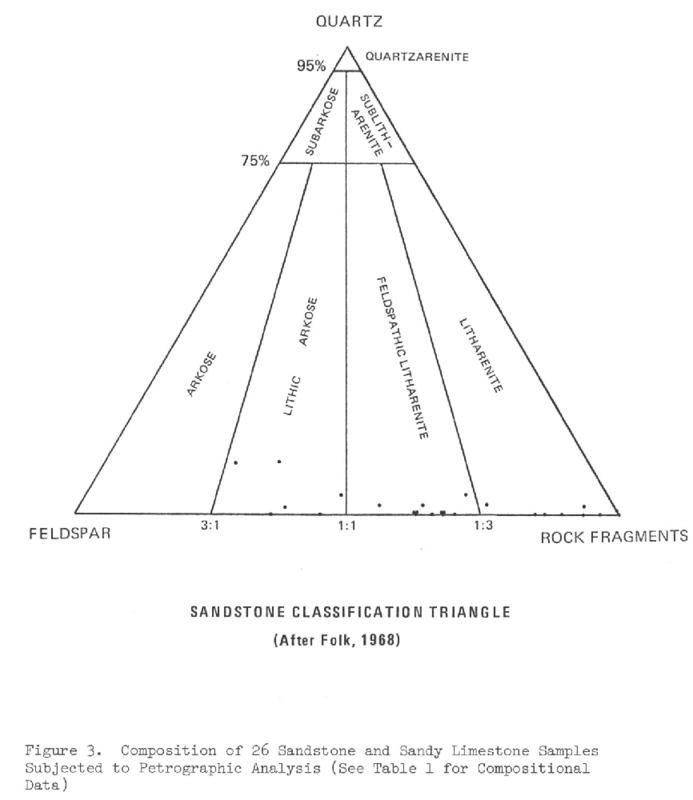 Sandstone beds (Analyses 1 and 2, Table 1) in the chert member are similar to sandstones found elsewhere in the section except they are slightly more quartzose and the feldspar to rock fragment ratios are higher than in most other sandstones; this suggests that they may be reworked. Quartz crystals in some of the sandstones are shaped like volcanic shards. Most sandstone beds in the chert member contain angular blocks of green and brown chert. The material which makes up the green chert consists primarily of altered volcanic ash. Minor amounts of siliceous fossils and calcareous sediment were worked into the ash by submarine currents. Following episodes of ash accumulation, concentrations of silica in the seawater were elevated favoring the epidemic reproduction of organisms with siliceous body parts such as radiolarians and sponges which contributed to the formation of red chert. About 60 percent of the limestone member consists of light gray, tuffaceous, fossilferous micrite or microsparite. Tuffaceous material seldom makes up more than a few percent of the purer micrites and consists of silt-size to very fine sandsize euhedral plagioclase crystals, microlitic volcanic rock fragments, opaque minerals, and devitrified glass shards. The tuffaceous material is etched by or completely replaced by calcite or altered to chlorite. Fossils include radiolarians, sponge spicules, foraminifera and Halobia? and Monotis. Many radiolarians are well preserved but some have recrystallized and others are etched or replaced by calcite. Most sponge spicules are replaced by calcite. Foraminifera are poorly preserved, but spherical, single chambered and multichambered tests are common in a few micrites. Halobia? and Monotis are usually completely replaced by chert and poorly preserved but some slightly silicified shells are well preserved. The pelecypods are concentrated in stacked layers with shells packed parallel to each other and to the bedding. The matrix consists of micrite with random sandsize patches of microsparite. Less commonly the matrix is made up entirely of microsparite. About 35 percent of the member consists of light brown or gray sandy limestone and volcanic sandstone. Sandstones (Analysis 4, Table 1) grade upward into sandy limestones (Analysis 6, Table 1). Gray sandstones and sandy limestones are usually difficult to distinguish from limestones in the field. It requires close examination to see the framework grains in the sandstones. The sandstone beds in the limestone member are similar to sandstones found in the rest of the formation except that they contain a greater abundance of allochems. The sandstones and sandy limestones from the lower part of the member contain radiolarians and calcareous fossil fragments. In the upper part of the member sandy limestones contain a number of additional allochems, many of shallow marine origin, including ooliths and oolith fragments and echinoderm and mollusc fragments. Nuclei of ooliths are in most cases composed of monocrystalline calcite but a few are composed of pyroxene, quartz, opaque minerals and fragments of older ooliths. Echinoderm fragments include round crinoid columnals and star-shaped spines, some of which are replaced by equant chert. Mollusc fragments consist of pelecypods and spiraled gastropods. Thin lenses of limestone boulder and pebble breccia comprise the remainder of the limestone member. The lenses contain- a variety of volcanic rock fragments, mostly microlitic, and limestone and sandstone rock fragments (Analyses 3 and 5, Table 1). Most limestone rock fragments were originally deposited in a shallow marine environment. A typical clast lithology is recrystallized, sparse,gastropod-foraminifera crinoid biomicrite. A few limestone clasts are similar to the micrites which make up most of the limestone member. The breccias also contain rare clasts of sandstone of lithology similar to the sandstone of the limestone member. Deposition of calcareous sediment and siliceous pelagic organisms probably continued at an even rate while the limestone member accumulated. Periodically, pelagic sedimentation was partly or completely masked by outpourings of pyroclastic material which fell into the basin, by epiclastic volcanic material which washed into the basin and by submarine landslides which carried shallow carbonate rocks and volcanic debris into the basin. The breccia member is predominantly made up of limestone boulder bearing granule to pebble, volcanic breccia lenses (Analyses 9 and 10, Table 1) and graded lenses of volcanic sandstones and tuff. Light gray fossiliferous limestone boulders in the breccia are up to 3 meters in diameter. The limestone boulders contain a great variety of shallow marine fossils (see Chapter 5 on Paleontology). Breccia lenses are very poorly sorted and coarser at the base of the member than at the top. The coarser varieties of breccia contain the aforementioned limestone components randomly distributed in a matrix of angular volcanic pebbles. Crude bedding can be made out in the less coarse breccia. Most volcanic pebbles are microlitic and contain plagioclase and pigeonite phenocrysts and less commonly quartz and hornblende phenocrysts in a groundmass of felted plagioclase laths. A few microlitic volcanic rock fragments are aphyric. Lathwork and felsitic volcanic pebbles are much less common. Individual crystals which are identical to phenocrysts in volcanic rock fragments usually make up less than 1 percent of the framework grains. As previously mentioned, the breccia member fills in the irregular, eroded upper surface of the limestone member. Ripped up blocks from the limestone member are found at the very base of the breccia member. The breccia member is interpreted as submarine landslide material which was derived from a shallow marine carbonate rock complex that fringed a volcanic landmass. Landslides were probably triggered by seismic shocks produced during volcanic eruptions. The same assemblage of detrital components is found in all sandstones in the San Hipolito Formation regardless of their bedding characteristics, grain size and textural maturity. Light olive gray thin-bedded sandstone dominates the lower part of the sandstone member. It is better cemented and framework grains are less altered to chlorite than the yellowish-brown massive sandstone and conglomeratic sandstone which dominates the upper part. Volcanic rock fragments Volcanic rock fragments range from very fine sand to boulder size, most are medium sand size. They are angular to subangular and randomly distributed. Volcanic rock fragments, especially the more heavily altered grains, are commonly indented by monomineralic grains such as plagioclase and they are commonly etched by calcite. Microlitic volcanic rock fragments with trachytic, pilotaxitic and hyalopilitic textures make up a minimum of 75 percent of the volcanic rock fragments. Microlitic volcanic rock fragments contain sand-size phenocrysts of plagioclase, pyroxene or hornblende, and rarely quartz in a felted groundmass of euhedral plagioclase laths. Black, sand-to-silt-size iron ore, often altered to hematite, is a common accessory. The remaining volcanic rock fragments have lathwork, felsitic and vitric textures. Lathwork grains have intersertal textures. The interstices between euhedral plagioclase laths in lathwork grains are filled with chlorite, dusty opaques, and rarely small crystals of pyroxene. Felsitic grains have a microgranitic texture and are made up of interlocking feldspar and quartz crystals. A small number of the feldspar crystals are subhedral to euhedral. Vitric grains consist of devitrified glass containing perlitic cracks filled with trains of dusty opaques. Volcanic rock fragments range from grains which have undergone little alteration to those which have been altered to pseudomatrix. The volcanic rock fragments were derived as epiclastic and pyroclastic material from a nearby volcanic island group. Plagioclase Plagioclase grains are commonly medium-to-fine sand size but range from coarse silt to coarse sand size. Their composition ranges from calcic oligoclase to sodic labradorite with an average composition of calcic andesine. The Michel-Levy (Kerr, 1959) method was used to determine plagioclase composition. Grains are commonly angular, euhedral, and cleaved crystals. A few consist of glomeropheric masses. Inclusion-free overgrowths, presumably diagenetic albite, are common in some rocks. Normal and oscillatory zoning is found in some crystals with up to forty zones present. Patchy, resorbed zones are present and are usually altered to chlorite or inclusion-free albite. Albite, carlsbad and pericline twins are common. Very few plagioclase grains are fresh; most are coated by chlorite and contain chlorite and/or calcite in fractures, along cleavage planes and in patchy zones. Quartz Quartz grains, which are fine-to-coarse sand size, are randomly scattered throughout some sandstones. Many grains have square or hexagonal outlines and are embayed. Grains are usually angular but some are almost perfectly round. Embayments and rounded shapes were probably caused by resorption along grain margins while the quartz was still in a magma. The grains are clear and commonly contain coarse silt-size, square inclusions with negative relief. A few contain hexagonal-shaped bubble trains. Most grains have uniaxial positive interference figures but a few are biaxial positive with a very low 2V angle. Quartz grains are unaltered but some are slightly etched by calcite cement. Pyroxene Grains of pyroxene comprise up to 16 percent of the framework grains in some samples and are found in more than 75 percent of the sandstones examined. Grains are sand size. Most are uniformly distributed in sandstones but some are concentrated in thin placers with other heavy minerals. Due to their cleaved and fractured nature, the original shapes of most pyroxene grains cannot be determined but they are rarely euhedral. Crystals are clear to very pale green in plane light and some green crystals are pleochroic to a very pale yellowish-green. Birefringence ranges from first order yellow through middle second order colors. Most of the pyroxene grains are augite but a few consist of pigeonite with small axial angles, sometimes as low as zero degrees. Few crystals are altered to chlorite and they are not commonly etched by calcite. Amphibole Amphibole grains are less common than pyroxene grains but comprise as much as 8 percent of the framework grains in some rocks. Amphiboles are rare as phenocrysts or as framework grains in rocks beneath the sandstone member. Green hornblende is dominant and brown hornblende is also present. Unaltered grains are euhedral crystals or cleaved fragments. Almost all hornblende is surrounded by reddish-brown rim of iron oxides. Biotite Biotite flakes are bent and deformed and almost completely altered to chlorite. Biotite has the characteristic parallel extinction, dark brown to light brown pleochroism, and high birefringence. It is not present in most rocks and is common in only one of the samples where it occurs as phenocrysts in volcanic rock fragments and as framework grains (Analysis 20, Table 1). Opaques Opaque iron-bearing grains, including magnetite and hematite, are present in rocks throughout the formation. These sand-size grains are randomly distributed and occasionally concentrated in placers one to several grains thick. A few grains are octahedral or square but most are round and look like opaque grains found in volcanic rock fragments. The grains are often fractured and many have been partly plucked during thin-section preparation. Grains are black or red in reflected light. The black grains have a sparkling metallic luster and some have a bluish tint. Black opaques are commonly rimmed by red hematite. Allochems are rarely found in sandstones and sandy limestones of the sandstone member. Radiolarians, poorly preserved foraminifera and pelecypod? fragments are present. A few glauconite pellets are present in some rocks. The pellets rarely display their original rounded shape because they have been squashed between more competent grains. The pellets are bright emerald green and fibers are very slightly pleochroic. Glauconite grains are fine-to-coarse sand size and are composed of trains of parallel fibers. Calcite and hematite cement are the orthochemical constituents. Hematite cement is found only in minor quantities and forms a thin coat on a few framework grains, fills tiny fractures, and is disseminated between framework grains. Calcite cement occurs as very finely to coarsely crystalline pore fill and vein fill. It etches and replaces grains. Calcite cement in rocks with high percentages of chlorite commonly contains chlorite inclusions. Coarser calcite is twinned and inclusion free. Calcite cement was derived from muddy carbonate sediment which washed into the basin during storms, mixed with terrigenous material, and reformed into cement. Some cement was also derived from pelagic and hemipelagic organisms; some still are present, but most have dissolved and reprecipated as cement. Chlorite is by far the most abundant mineral in this category. Clay amygdules in a pillow lava sample were identified by x-ray diffraction methods as chlorite. Matrix material present in rocks throughout the stratigraphic section have about the same optical properties as the chlorite amygdule filling and, therefore, is also considered to be chlorite. Chlorite occurs as inclusion-free coats and rims on framework grains and fills in pores between grains. It grows within volcanic rock fragments, plagioclase, pyroxene and amphibole grains and in some cases entirely replaces them. In plane light, the chlorite is yellowish to greenish-yellow and occasionally pleochroic. It has very low birefringence and parallel extinction. Almost all matrix material, including clay coats, rims and porefill, fits the criteria established for phyllosilicate cement (Dickinson, 1970). None of the matrix material fits the criteria set forth by Dickinson (1970) for protomatrix, orthomatrix, or epimatrix. Matrix percentages in a few modal analyses are probably higher than they should be because some pseudomatrix may have been counted as porefilling phyllosilicate cement rather than as framework grains from which the clayey material was derived. Zeolite minerals fill pores and veins in sandstones throughout the section. However, zeolite-filled veins are rare in other types of rock in the formation. Zeolite crystals which fill pores are too small to identify optically and they do not make up enough of the rocks to be identified with the x-ray diffraction technique suggested by Sheppard and Gude (1964). Some zeolite crystals in veins are large enough to identify optically and they include the minerals heulandite and stilbite. Zeolites identified by x-ray diffraction methods were obtained from veins and include analcime, stilbite, and laumontite. Inclusion-free patches and rims of feldspar in and on detrital plagioclase grains are tentatively identified as authigenic albite. Albitization of plagioclase takes place in areas in plagioclase grains where solutions could move freely, including along fractures, cleavage planes and on the exposed outer surface. A very rough estimate of the amount or plagioclase that has been partly or wholly albitized is 15 to 20 percent. Beds of tuff, calcite cemented tuff and tuffaceous limestone are important constituents of the lower part of the sandstone member but are less common in the upper part. The beds are several centimeters to 3 meters thick and are light olive, reddish-brown, dark yellowish-orange, or light gray in color. Tuffaceous material consists of silt to very fine sand-size grains of twinned feldspar, volcanic rock fragments, pyroxene or amphibole, quartz, devitrified shards, and opaques. Radiolarians are present in most of the rocks. Some tuffs are moderately well to well laminated and consist of alternating layers of finer and coarser grains. Others are massive with grains randomly distributed in a nearly isotropic, aphanocrystalline matrix. Whole rock x-ray diffraction analyses of tuffs yielded well-developed x-ray diffraction patterns but they could not be successfully interpreted. Calcareous tuffs contain patches of very finely crystalline calcite or laminae of finely crystalline poikilotopic calcite cement which surrounds tuff grains. Some contain radiolarians Which have been replaced by calcite. Other than the fact that they contain calcite, the calcareous tuffs appear identical to noncalcareous tuffs. Tuffaceous limestones are also similar to tuffs except they contain greater than 50 percent aphanocrystalline to finely crystalline calcite. They also contain more fossils including radiolarians and fragments of thin-shelled pelecypods which may be Monotis. A few limestones contain sand-size framework grains (Analyses 11 and 16, Table 1). Etching and replacement of framework grains by calcite is more extensive than in rocks with lower calcite content. Feldspar to rock fragment ratios are higher than in rocks which contain less calcite. This occurs because rock fragments are more readily etched and replaced by calcite than monomineralic grains. A few dikes and sills up to 2 meters thick intrude the San Hipolito Formation. A dike intrudes the northeast-trending fault near Campo Viejo. Another dike was injected along a fracture perpendicular to bedding in the chert member. Sills intrude the chert member and the pillow lava member. Intrusive rocks generally consist of crumbly green grus but locally they are well preserved. A sill which intrudes the pillow lava member contains zoned and twinned, euhedral augite phenocrysts 1 to 2 millimeters across and zoned and twinned andesine phenocrysts up to 1 millimeter in length in a groundmass of smaller, randomly oriented plagioclase laths. Much of the groundmass is altered to chlorite. Very finely crystalline to finely crystalline intergrowths of chert, calcite, and chlorite fill a few pyroxene-shaped spaces. The sill that intrudes the chert member is more heavily altered. A sample from the sill contains about 15 percent potassium feldspar. It is the only sample that was stained which contained more than 1 percent potassium feldspar. Chert in the vicinity of the sill is altered and recrystallized. The rock has a diabasic texture and contains phenocrysts of augite and altered plagioclase in a matrix of smaller plagioclase laths which are mostly altered to chlorite and celadonite or replaced by calcite. Some of the phenocrysts are also partly or wholly altered to chlorite or celadonite or replaced by calcite. Most fresh plagioclase crystals are normally zoned. Cores of most plagioclase crystals are replaced by calcite and the remaining outer shell has been altered to potassium feldspar. The potassium feldspar may be a metasomatic alteration product of sodic plagioclase.